If you are short of time, the answers to the following 3 questions should let you know all you need to about the BabySonic electric toothbrush. 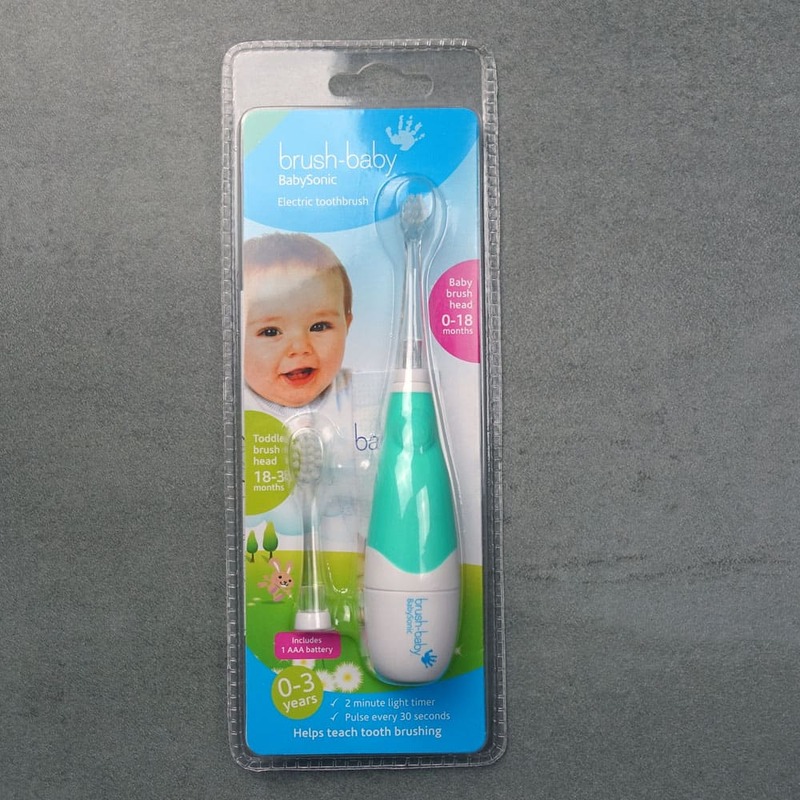 If you want more detail, you can read our full Brush-Baby BabySonic review further down the page. Given that this is an electric toothbrush for babies and toddlers it is surprising just how much is built in and how well it performs for the price. There are few options when it comes to electric toothbrush for babies and toddlers. There are a couple of ‘copycat’ versions of Brush-Baby, but I would avoid these. Most alternative options tend to be manual brushes and this is not all that unsurprising given the target market. Babies do not need an electric toothbrush, but it can aid in the cleaning. 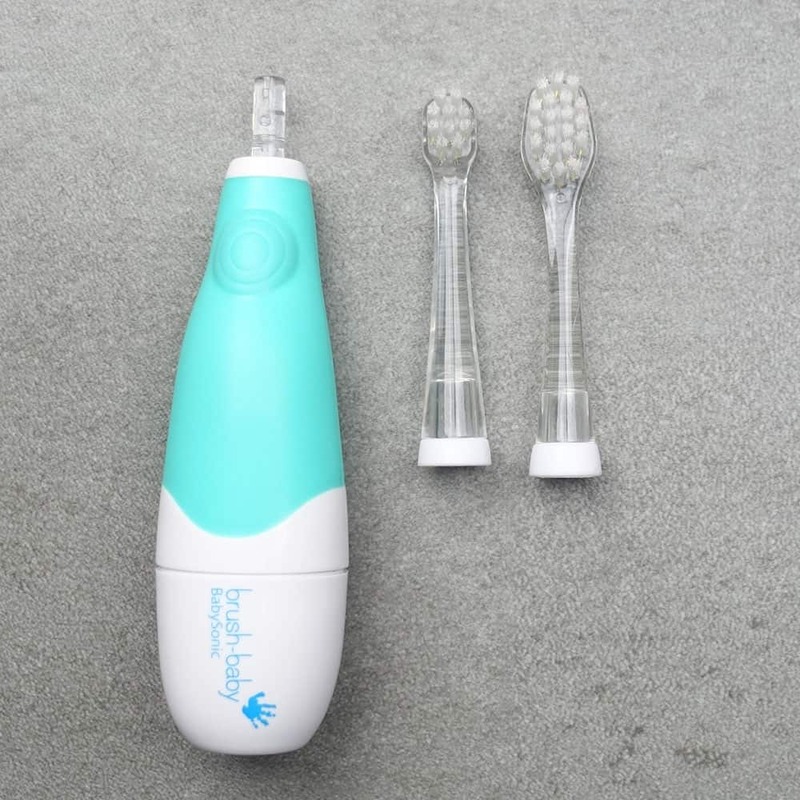 One option is the Foreo ISSA Mikro (view on Amazon), but as it is expensive and not all that impressive, I would suggest considering a couple of options found on my list of best baby toothbrushes, the Wisdom Step by Step 0-2 years or the Baby Banana Teething Toothbrush (make sure you see our caveats on replicas). 3. 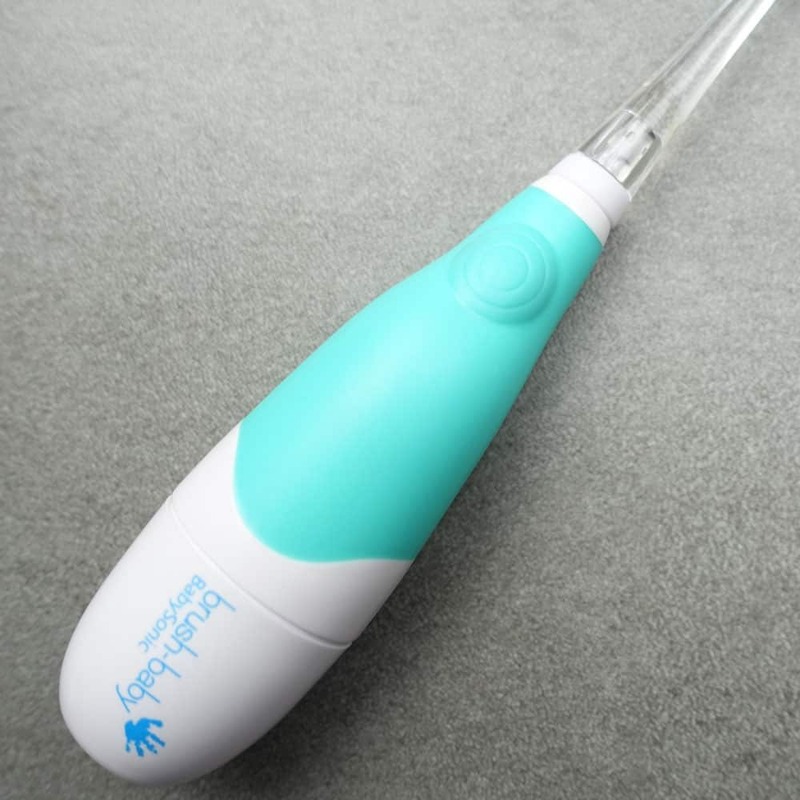 Where is the best place to buy the Brush-Baby BabySonic? Amazon is a particularly popular outlet to buy from because they tend to very price competitive and offer quick delivery options nationwide. Boots, Mothercare and Ocado are all stockists as well. You can also buy direct from Brush-Baby. This is one of the only options when it comes to electric toothbrushes for babies and toddlers in the UK. The call for electric brushes are limited, but there is certainly a market for them. Some babies do not like the sound or sensation, and the brush is a few pounds more expensive than the manual brush. However, there are some features that can make your life as a parent easier, whilst also aiding with teeth cleaning education for your little one. Awarded Silver in Best Bathtime product category at the prestigious Mother&Baby Awards, there is something Brush-Baby are doing right here. Here are what I consider to be the pros and cons of the BabySonic. 1 cleaning mode – Nice and simple and easy to use, no complicated additional modes. 2 minute timer – A timer is built in to help you as a parent or guardian brush for the right amount of time whilst also helping children learn how long to brush for. 30 second pacer – Encourages even brushing of the teeth and gums so as to avoid spending too much time on just 1 area of the mouth. Automatic power off – Turns the brush off when the clean is complete. LED – A white light shines through the clear brush neck/head to help light up the small space inside a child’s mouth. Power – The 16,000 movements per minute help achieve a better overall clean for your child’s teeth. Design – Not the most child friendly brush. Not as engaging as some other options. Power/sound – Some children will not like the sound and sensation that the electric motor delivers. Reliability – More susceptible to damage than other products due to the electrical motor and design of brush. 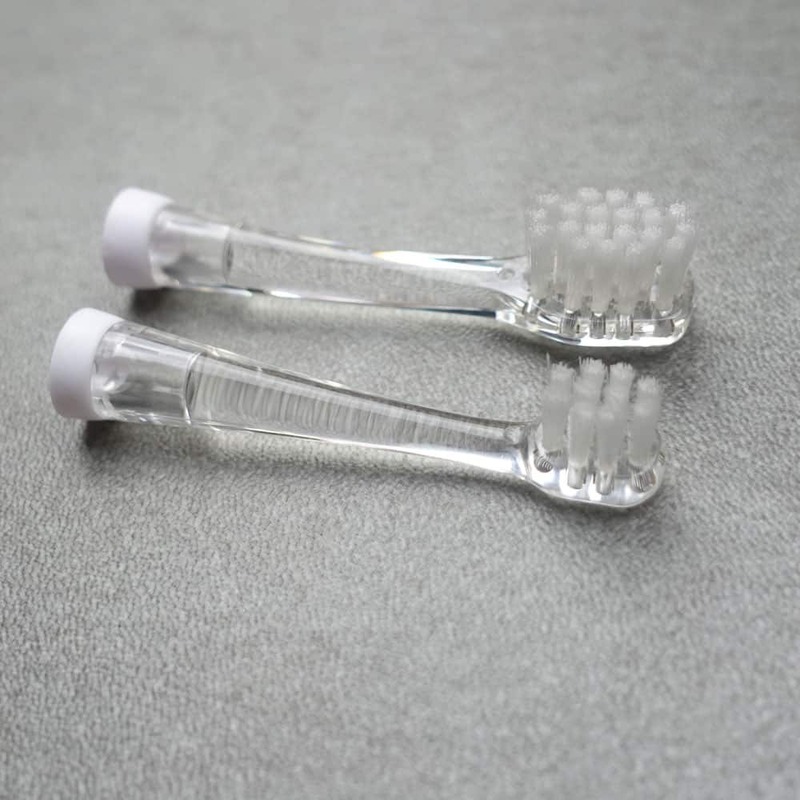 Price – It is more expensive than most other baby toothbrushes. 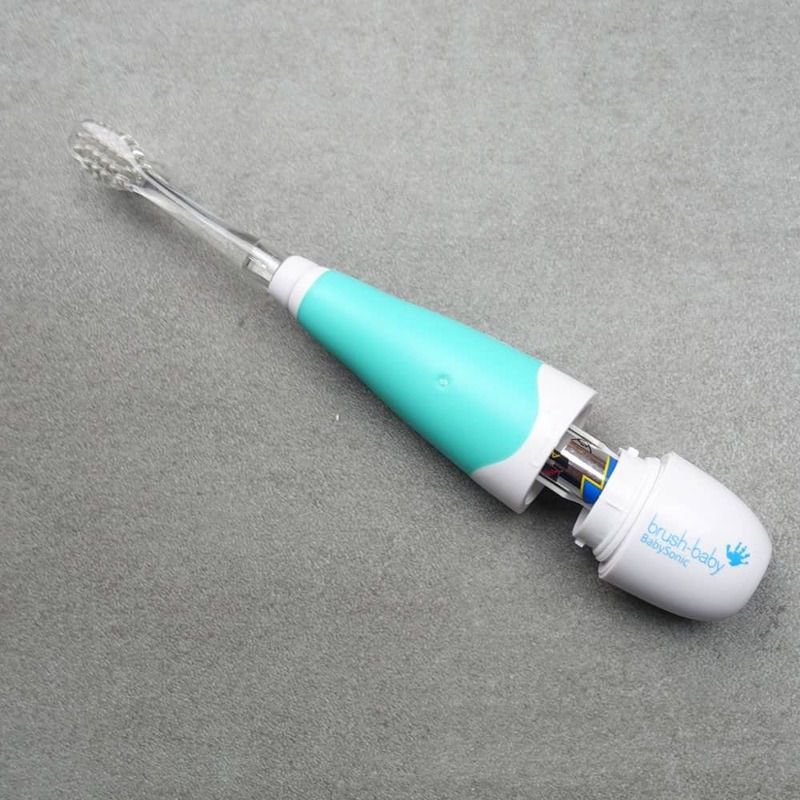 When many hear or think about an electric toothbrush, they often think of quite a big and chunky unit, however the BabySonic really is anything but. Designed for babies and toddlers you could argue it needs to be a bit smaller than a conventional brush for them to be able to use. It comes in a primarily green and white colour combination. The handle itself is not perfectly rounded, but is a bulbous type shape that tapers a little towards the top and bottom of the handle. There is also a slight curve in the body shape (most visible side on). The bottom half of the handle is the removable cap which houses the single AAA battery that powers the brush. There is a small break/ring around the handle as a result of this removable cap, taking away from the otherwise smooth design of the handle. Small icons on the rear of the brush handle make it clear when the cap is correctly fitted. There are rubber seals inside to help protect from water ingression. When fitted, on the front of the brush is the Brush-Baby logo. The brush is gloss white plastic, and the logo is is printed in blue. The upper half of the handle is primarily green in colour as a soft touch grip runs around the handle. Just below the top of the handle, at the point at which the brush heads attach is a single power button that turns the brush on and off. It is a 2 stage button, in that you press it once and it turns on the LED, press it again and it launches the 1 and only cleaning mode on the brush. It does provide a nice resistance and feedback. Not as slim as a manual brush, the rounded shape fits relatively well in parent and children’s hands alike. Some parents might wish for a slightly longer handle to help with reach, but I haven’t found this to be much of an issue. Whilst you should always supervise a child when brushing and do the majority of the brushing yourself (until the age of about 7 or 8), it can be very effective to help them build their skills and learning to let them hold and brush themselves a bit too. I found my son at times took a 2 handed approach or gripped on around the neck of the brush head rather than the handle. The brush will stand upright thanks to the flat surface and if laid flat will roll a little. Overall the design is not as colourful or as engaging as many other brushes, a bit adult like, but I personally don’t see it as a big issue. Yes your child might prefer the look of the bright blue or orange brush, but given that 95 percent of the time or more, the brush is encased in your hand as the parent, they don’t really see or get all that much benefit from it. You might feel a little differently. Brush heads are detachable, but rather than pull on and push off as is common, the heads need to be twisted 90 degrees to lock and unlock them in place, stopping little ones pulling it off and reducing any chances of unwanted incidents. In the box you get 2 different sized heads. The smallest is designed for babies and toddlers from 0-18 months, whilst the larger is for those aged 18-36 months. This age range is a bit of a guide as each child’s mouth and development is different. 1 of each might be supplied, but you can buy replacements in packs of 2. What I like is that this brush should last 3 years, with just the need to replace the brush heads every 3 months and not the whole brush. As is the case with an adult toothbrush, children’s toothbrushes (or the heads at least) need replacing every 3 months. Given that a child can bite and there is quite often a less even wear pattern on the bristles, it can be necessary to replace them sooner. Frayed, split or damaged bristles can do more harm than good, so do pay attention. Some have reported that the bristles on the head can come out when bitten or chewed. In the 4 months I have used this with my son, I have seen no evidence of this, although as is expected a bit of biting has caused the bristle formation to change. Geared for use from 0 months, I personally did not begin using this until my son was 6 months old as it didn’t feel quite right using the power and motion on his gums. 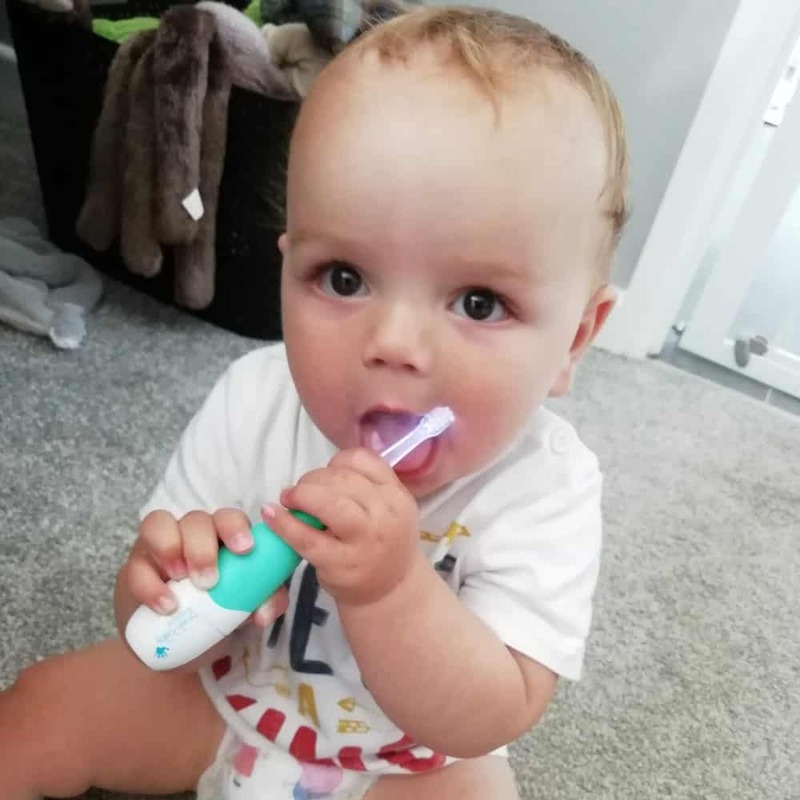 To be honest the earlier the child gets used to the sensation the better, but it is not necessary to use a toothbrush like this really before the baby gets their first teeth through. Brush-Baby’s dental wipes (view them here on their site) were my choice prior. Some children will not like the brushing sensation, sound and power that this brush delivers. Nor will some parents. That is fine, it is personal choice. However, it can be a case of trial and error, so attempting to use this brush a few times may gradually win your child over. You do not need me to tell you that being fun, engaging and interactive can help get them on board and my son took to this with little hassle. As a parent and having tried many brushes, I know an electric toothbrush is perhaps a bit overkill for a baby. However, what I like is the peace of mind it brings knowing that there are those little extra movements going on at the tips of the bristles that help clean the teeth that bit better than purely relying on my movement of the brush. We all know that the aim is to brush for 2 minutes, but 2 minutes of compliance with a toothbrush from a stroppy baby can be difficult and a minute of brushing might be all that is possible at that moment, and even then you are unlikely to move the brush to all the areas of the mouth you want. For me, those extra movements just leave me a bit more confident that the 1 minute of cleaning with electric is more effective than 1 minute of manual brushing. 16,000 movements per minute is what this brush offers. 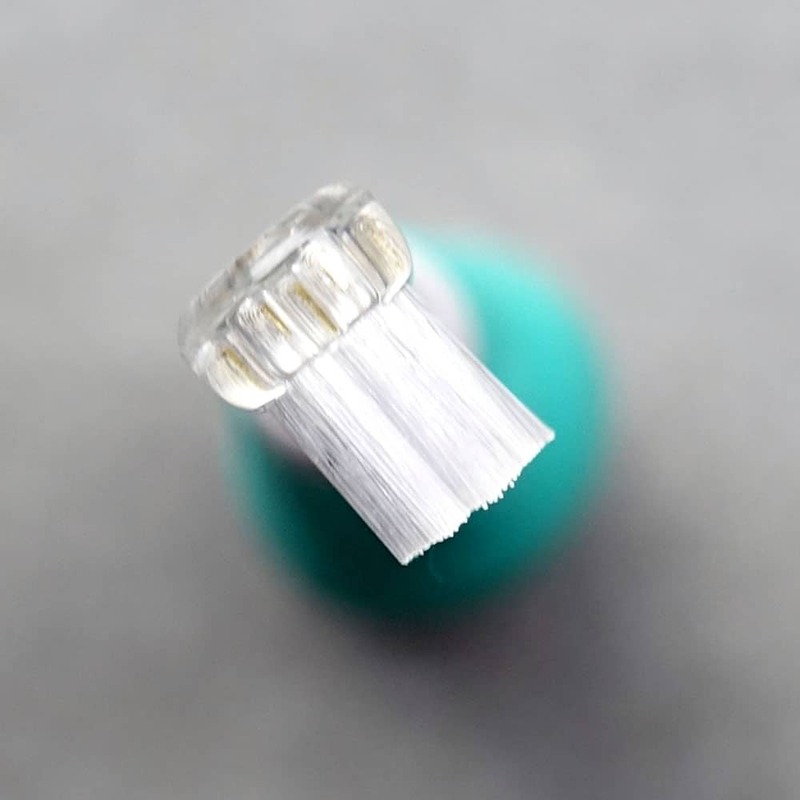 You can hardly see the bristles move, but they do and it helps dislodge plaque and bacteria that little bit more effectively. As the motor works the handle vibrates to send the movement to the bristles. Place the head on your fingertip and you will really feel it working. Built into the brush handle is a timer and pacer, features even some adult electric toothbrushes seem to omit. I am sure you know, that dentist recommend brushing for 2 minutes. Ideally, you should break the mouth up into quadrants (4 sections – upper right, upper left, lower right and lower left) and spend 30 seconds cleaning each. From the moment the brush is powered on, the timer kicks in and at 30 second intervals there is a slight pause in the motor which alerts you that it is time to change. You will also hear a change in sound too. This continues until the 2 minutes time is reached at which point the brush automatically turns off. In the early days few parents will achieve 2 minutes of perfect brushing, but the timer is present to help you monitor how long you are brushing your teeth for and I am convinced that it will long term help educate the child that this is the correct brushing time. Another neat feature if the LED/torch built into the handle. Yes you are probably thinking WTF? !, but hear me out. The neck of the brush heads are a transparent plastic, and when powered on a white light is shone into the neck from the brush handle, thus illuminating the neck of the brush. For some kids they may see this as quite ‘cool’ if brushing in a dimly lit room for example, but it does also act to shine light into the mouth of the baby or toddler allowing you to get a glimpse of teeth and gums that can become obscured by the child’s small mouth, persistence to bite down/close the mouth, dribble and put their hands in the way. In other words it is a simple tool that might just help you manage better brushing. Of plastic construction, the brush is fairly durable, but given it has a small electrical circuit on board, compared to the manual alternatives I don’t think it will survive the test of time quite so well, if not looked after. My unit has not broken or been damaged in any way, but my son has pulled it and thrown it a few times, so it is potentially possible it will break more easily. The battery compartment is of course a possible risk too, but you cannot really get away from this given it is an electric brush, but it is clear every effort has been made to stop water ingression. No immediate concerns overall, the fit seems good and with appropriate care and maintenance all should be fine. 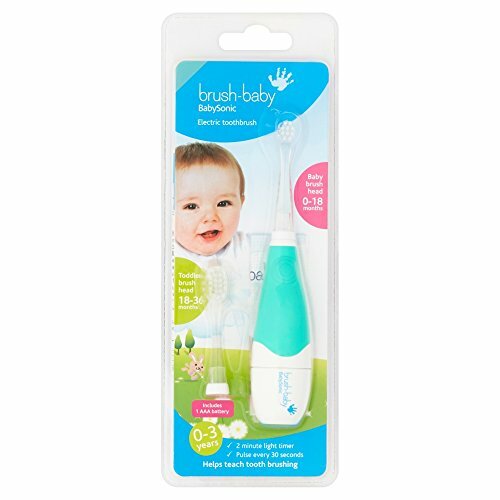 BabySonic is powered by a single AAA battery, which comes supplied with the brush. 4 months on and it is still going strong with no signs of slow down. I can’t say exactly how long it will last for, but my guesstimate is going to be 6 months or more, which is more than acceptable. I wish I could be more accurate with how long it will last, but as you probably are well aware, the brushing times can be a little inconsistent with a baby. The battery sits in a plastic frame inside the brush handle which is accessed via the removable cap on the bottom of the brush handle. Twist it about 45 degrees anti-clockwise and then pull down to release. You can’t get the fitting wrong really, the cap simply won’t lock in place if you do and it will be obvious to look at. Being an AAA battery, you will usually have loads of these in a cupboard, because kids toys need batteries, but if not they are easy to source. 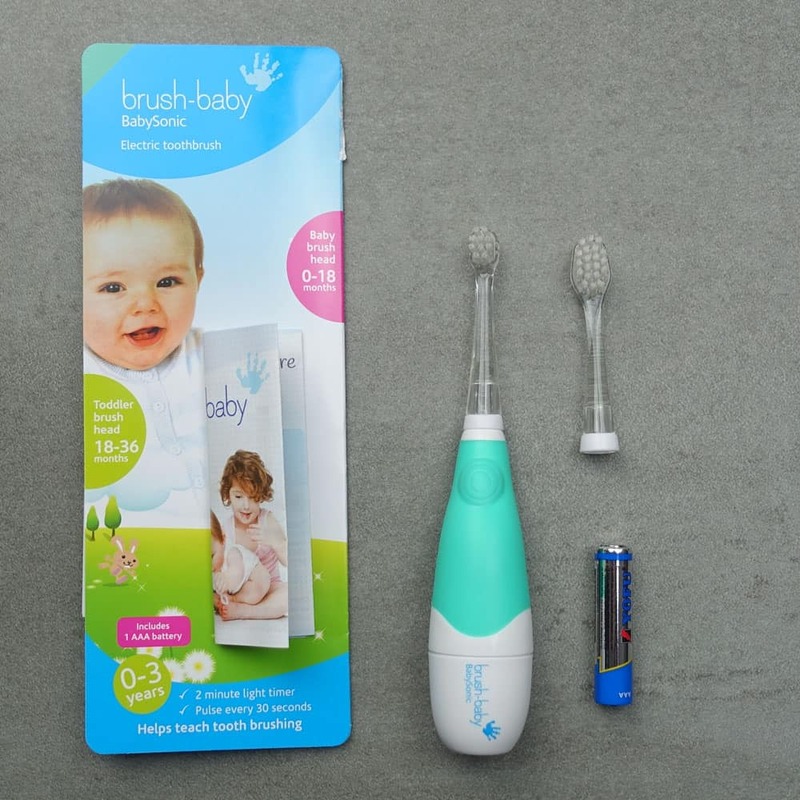 Being one of the only electric toothbrushes for babies available here in the UK, it is actually stocked in a wide variety of stores — we’ve included a list of options here. Give or take a penny or 2 here and there, it is sold for £8.99. For this price you get the brush handle, 2 different sized brush heads and an AAA battery. Replacement brush heads are priced at £3.75 for a pack of 2, so that is £1.88 per head every 3 months. You will need to factor in the cost of replacement batteries too. Approximately 1 every 6 months or so. Assuming you were to use this brush from 0-36 months you are going to be looking at a total cost of about £30 over 3 years. That is just 3 pence per day. Given that Wisdom’s step by step brush is priced at £1.50-£2, I think BrushBaby is fairly competitively priced, with just the slight initial premium for the electric handle. 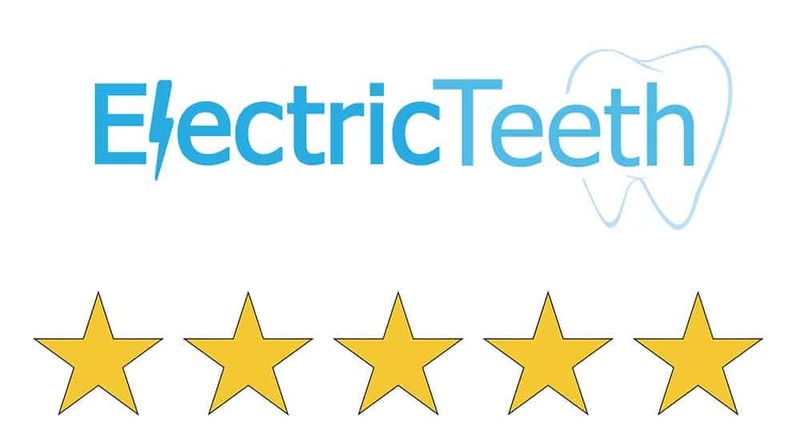 With all products reviewed here at Electric Teeth, we endeavour to test them as best as we possibly can. Given the target audience, most feedback is achieved from whether or not you manage to brush for a full 2 minutes and what hassle is involved in the daily ritual. Thankfully, my now 10 month old son has been very helpful in testing and I can speak first hand about what it is like to use on a day to day basis. Overall the quality of the brush feels really good and I have no overriding concerns. I see no reason that it should not remain functional for a good number of years, if parents supervise the child, replace the brush head regularly and keep the brush clean. In the 4 months this brush has been tested it has survived and performs as well as it did when it was new. It has been dropped, mainly onto carpet rather than a hard tiled floor. The brush is really most at risk when you allow the child to try a bit of independent brushing. They can chose to throw it or test it in ways that you wouldn’t imagine. 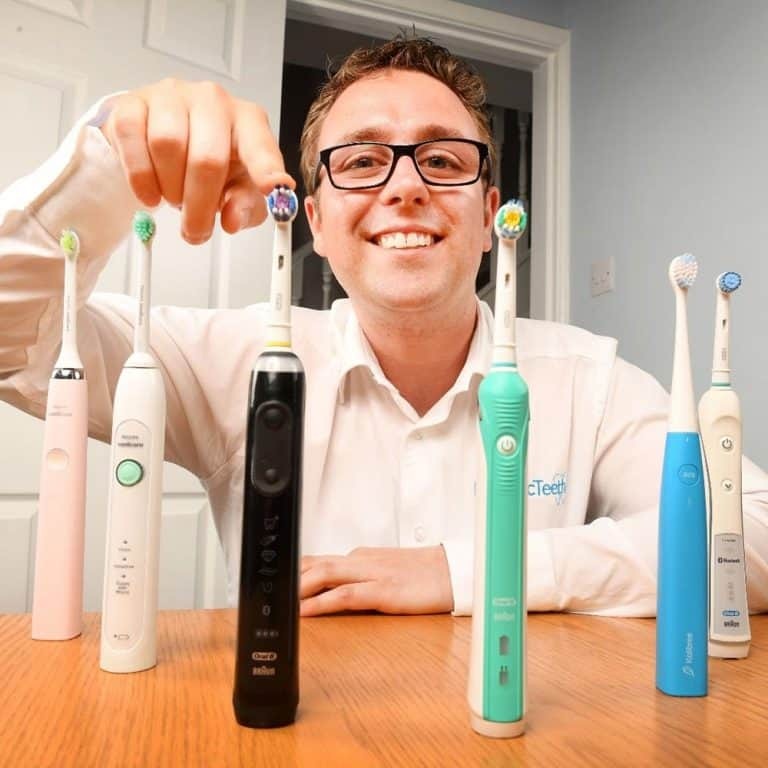 Should you experience any issues you can always contact Brush-Baby for assistance, the UK based company will be happy to help and ensure you are satisfied with their products. 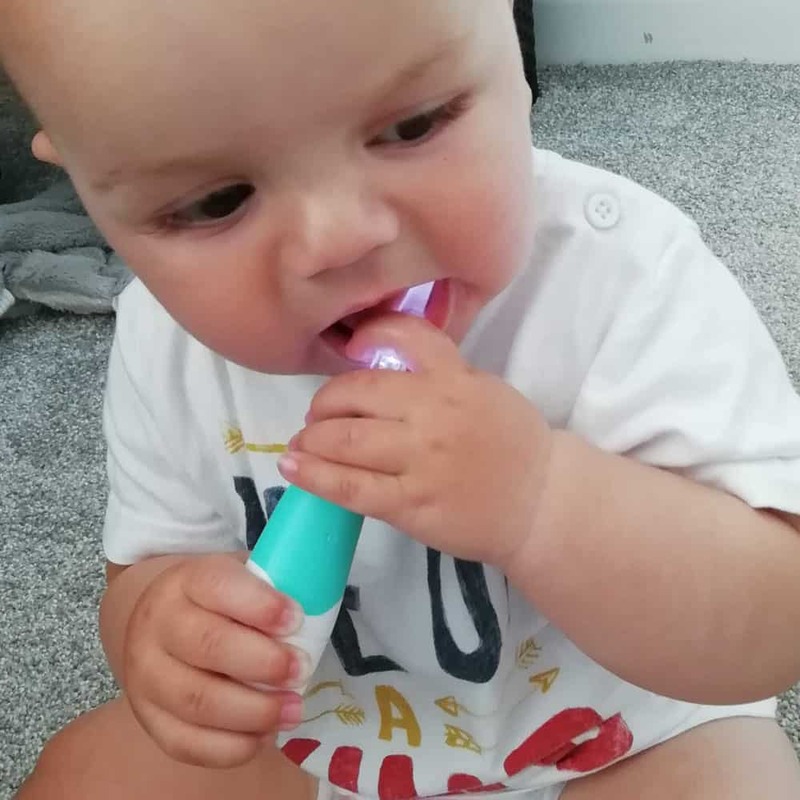 From a design, interactive and engagement point of view, the Brush-Baby BabySonic toothbrush is not going to win the hearts and minds of your baby or toddler over some of the more colourful alternatives. However, seeing as it is down to you as a parent to brush your child’s teeth at this age and your hand covers most of what makes a brush engaging, this is not a make or break issue. This possible weakness is more than made up for in the cleaning capability, the built in timer, pacer and the fact that it works for a broad age group, just swap out the brush heads. This brush may be a touch more pricey, but if your child doesn’t mind the sound and sensation that this sonic toothbrush offers then I do believe it is worth every penny. 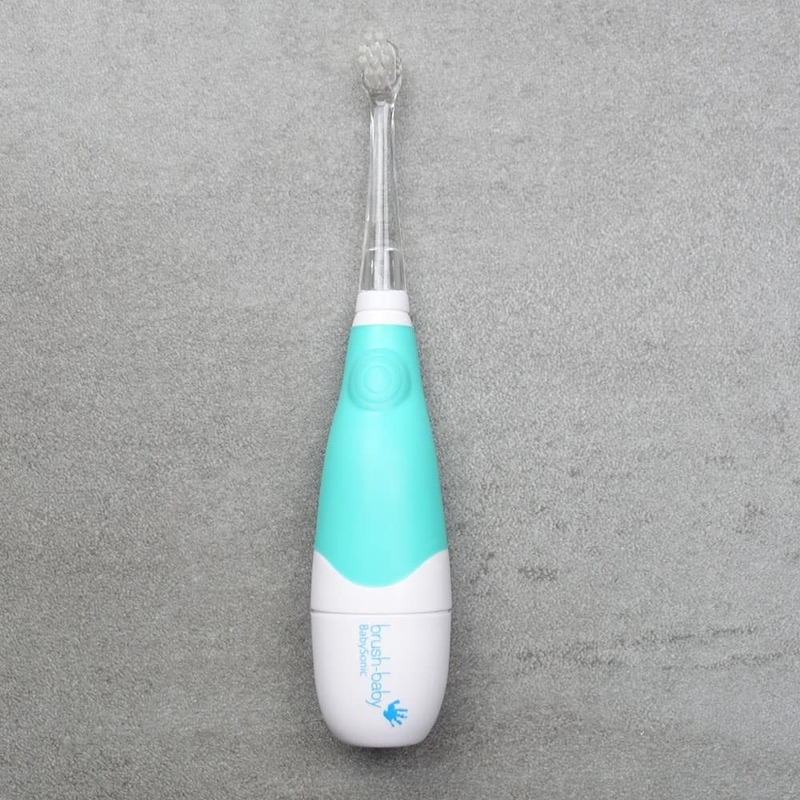 You gain a little extra confidence that the vibrating bristles are going to help clean the teeth that bit better than relying on manual motion alone. Few 2 year olds will pay much attention to the timer, but small touches like this help set the foundations for strong tooth brushing habits in the future. Do you own or have you used the Brush-Baby Sonic with your little one?